Home Vape Reviews Dry Herb Vapes Quant 3-in-1 Vaporizer Review: Does it Do it All? I have to say I was skeptical when I first opened the box of the Quant 3-in-1 vaporizer. To be honest, I go into every review as skeptical as possible. We all know what it’s like to get a hot new device – and have amazingly high hopes for it – only to have them smashed when you actually try the dang thing. I was initially surprised by the weight of the Quant 3-in1 vaporizer. It’s far from heavy but it’s by far more solid than any other dry herb vaporizer I’ve used. I was sent the Walnut Wood Finish Quant 3-in-1 and I was instantly impressed with the finish and the design. It’s both beautiful and sleek, even with the solid feel in the hand. The Quant also offers a small design so it fits into your hand well. In case you are wondering what a 3-in-1 vaporizer is, let me clarify. The Quant can be used for dry herb, wax and liquid. Sounds pretty cool, right? Let’s see how she did. The Quant vaporizer’s design is definitely top-notch. First off, as usually, I plugged the Quant in to charge, via the included USB cable. It took about an hour and a half to charge, which is indicated on the giant LED display. Quant describes the LED display as “Organic white.” I describe it as big and clear enough to read without my glasses on, which in my book is a huge bonus. I mean, let’s get real, some of these devices have dinky little screens that we all have to squint to read and that’s just a pain, no matter how cool the thing is. So, right after I knew she had a full charge, I turned the Quant 3-in1 vaporizer on and let it sit. This kind of device isn’t one that you are going to use all day or perhaps even every day, but when you reach for it, you want it to be charged and ready to go, right? You also don’t want to be wondering if you turned the dang thing off. Again, I was impressed with the Quant. When I went back 10 minutes later to check it, it had powered off. According to Quant, it automatically shuts down after four minutes. I put some my Vapor Brothers Feeling Fine Herbal Blend – and yes, it’s a totally legal blend of damiana, peppermint and lemon balm – and turned it on. Holy Sh%T did the Quant 3-in-1 Vaporizer heat up fast! And, while it’s heating up, it tells you right on the awesome display screen what temperature it is, so you can see just how fast it’s heating. Another bonus in my book because there are no guessing games. It hit the baseline 320-degree temperature in seconds. And doesn’t take too much longer to reach the top temp of 430 degrees. Now, if you are new to dry herbs, do your research to see what temperature to use for the product you have. Different herbs are going to need different temperature settings. A quick google search should answer any questions on this. The Quant mouthpiece is a good feel and I was happy with it. The Quant 3-in-1 vaporizer boasts a hybrid air heating system for its tank and I have to say it delivers. Let’s talk about the 3-in-1 aspect for a minute. The color I was sent has a cool, rugged look to it. The Quant 3-in-1 vaporizer comes with everything you need to get started – except the herb. You’ve got your charging cable, a packing tool, a cleaning brush and a set of tweezers. So, when it came time to switch from dry herb to wax, I didn’t have to dig around for anything, I had everything at my fingertips. To use wax in the Quant 3-in-1 you have to use the included tank. This is where I found drawbacks with the Quant 3-in-1. The tank is a tiny little thing. I don’t have huge hands, I would consider them about normal size and it was a pain for me to handle this little tank. Getting the wax into the little quartz tank was an unpleasant process and I would think a man, with larger hands would struggle even more. But, once I got the miniature tank into the Quant 3-in-1 vaporizer, I was happy with how the Quant performed. I had the same problem when I attempted to clean out the tank to use it with oil. And let me just add, try your best not to get the oil on your hands or that tiny little sucker is gonna slip out of your hands and you’re going to have a mess. And yes, I learned that one from experience. However, I was also impressed with how the Quant performed with the oil. Keep in mind, the Quant 3-in-1 vaporizer is listed by Quant as a dry-herb vaporizer for it’s primary use, and for this use I had no issues at all. 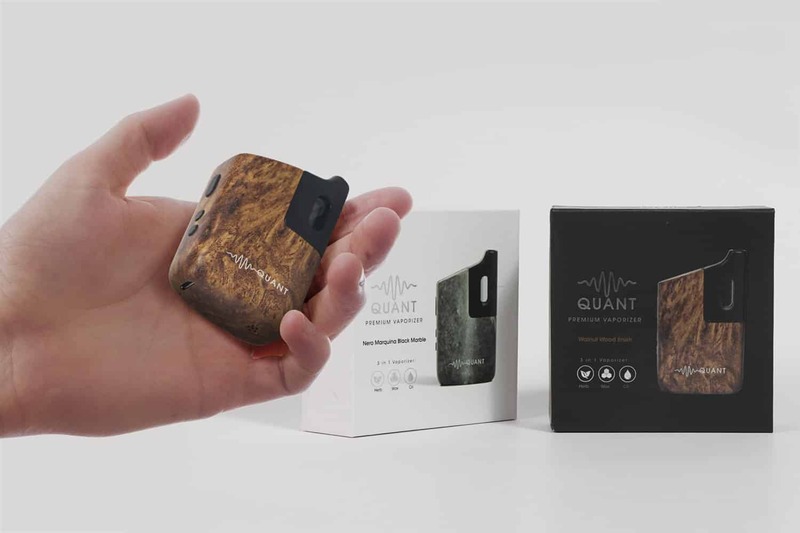 On the company’s website, the Quant 3-in-1 vaporizer in Walnut Wood Finish sells for $169.99. It is also available in nero marquina black marble for the same price. For a dry herb vaporizer this price isn’t bad. For one with an awesome, large and readable screen, with a large heating chamber, a built-in shut off and offers the options of using it for wax and oil, that price is pretty on the mark. And remember, the Quant 3-in-1 heats up super-fast and that’s huge to me. Not wait time and right on the mark. To sum it up, the Quant 3-in1 vaporizer is a solid device, I used it daily for 10 days and it did not require charging. The large tank makes for easy cleaning and the huge screen takes out any guess work. I was impressed with Quant 3-in-1 vaporizer.